Cauliflower facts, an information sheet for kids cooking activities. Cauliflower facts and general information about cauliflower. Available year round but cauliflowers true season is fall-early spring. Cauliflower grows from a tiny seed planted in your garden. 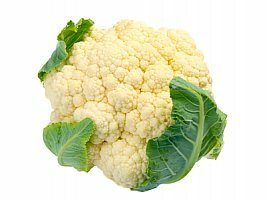 Look for firm cauliflower, white with no black spots. Boil, steam, chopped in side dishes or salads. Eat as is. Cauliflower helps prevent cancer, is high in fiber and is high in Vitamin C.
Boil large saucepan of water. Add cauliflower and boil uncovered about 5 minutes. It is tender when you can pierce it with a fork. Dont cook too long or it will be too mushy! Have an adult prepare cheese sauce with childs help if too young to use stove top. Melt margarine in saucepan. Stir in flour. Mixture will be thick-this is called a roux. Stir in milk gently and stir together. Stir in cheese and keep stirring and cooking until melted. Serve either poured over cauliflower or on the side for dipping. Have adult sauté onion in butter then stir in flour and salt. Gradually add cream, stirring constantly. Add broth according to desired thickness of soup. Add broccoli and nutmeg. Cook over low heat 25 minutes. Stir occasionally. *** You can also use broccoli in place of cauliflower.